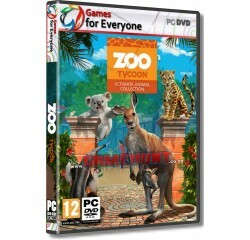 Zoo Tycoon - Ultimate Animal Collection (Windows 10) - R120,00 : Game Hunt, Where we lead, others follow. The wildly popular Zoo Tycoon series gets fully-remastered and set to crank up the excitement, challenge, and fun of building the ultimate zoo. Let your imagination run wild with Zoo Tycoon: Ultimate Animal Collection! Choose from almost 200 visually stunning animals and the largest, most detailed selection of environments ever, then build, manage, and maintain your dream zoo alone or with up to four players on Xbox LIVE. This zoo simulation will charm animal lovers of all ages. New wildlife from South America and Australia. Operating System - ONLY Windows 10 - 64bit build 1607 or later. (Developer Mode MUST BE enabled before you install this game). Processor - Intel Core i3-3210 @ 3.2 GHz || AMD FX-4150 @ 4 GHz® or equivalent AMD® processor.